Working alongside the marketing team, my boss and the senior designer, my role in this project was research and design. Following the rebranding of CBS Sports and it's affiliates, the CBS Sports Network website was in need of a responsive and modern redesign. In addition to updating the look and feel of the website, our challenge was to streamline the content, improve the visitor bounce rate, and find a more effective way to incorporate the channel finder. We also wanted keep users engaged by encouraging them to view content and learn more about CBS Sports Network shows and live sports coverage. The old website did little to engage the viewer or provide content that would keep them interested. Additionally, it was not responsive. Following the rebrand of CBS Sports, we wanted the new website to look similarly modular and flat. It should also be consistent with CBSSports.com, which drives traffic to CBS Sports Network through the "Watch" link. With these analytics in mind combined the marketing goal of driving tune-in and raising awareness to the channel, we proceeded to research competitors. We began by conducting research and examining comparable websites for inspiration. We looked at a mix of editorial and television network websites. 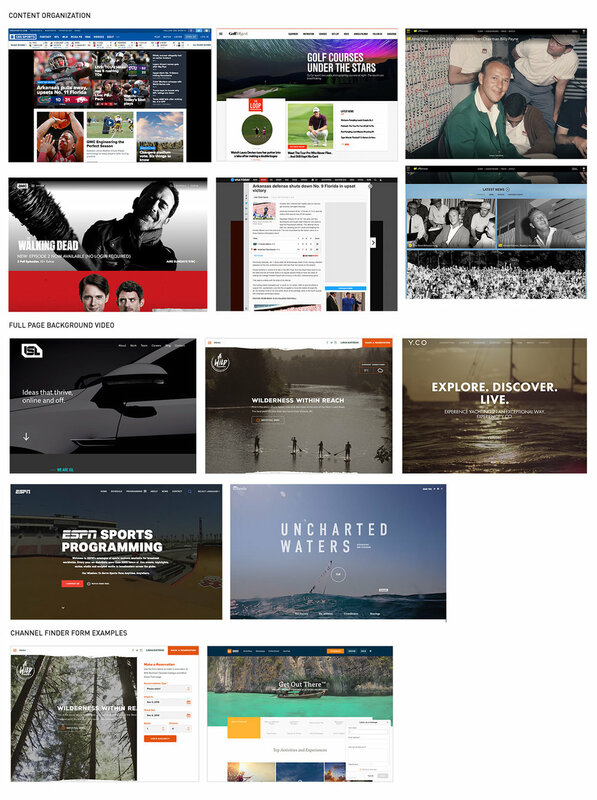 We also looked at all the different ways these websites incorporated video into their design. We also looked at CBSSports.com - the online arm of CBS Sports. 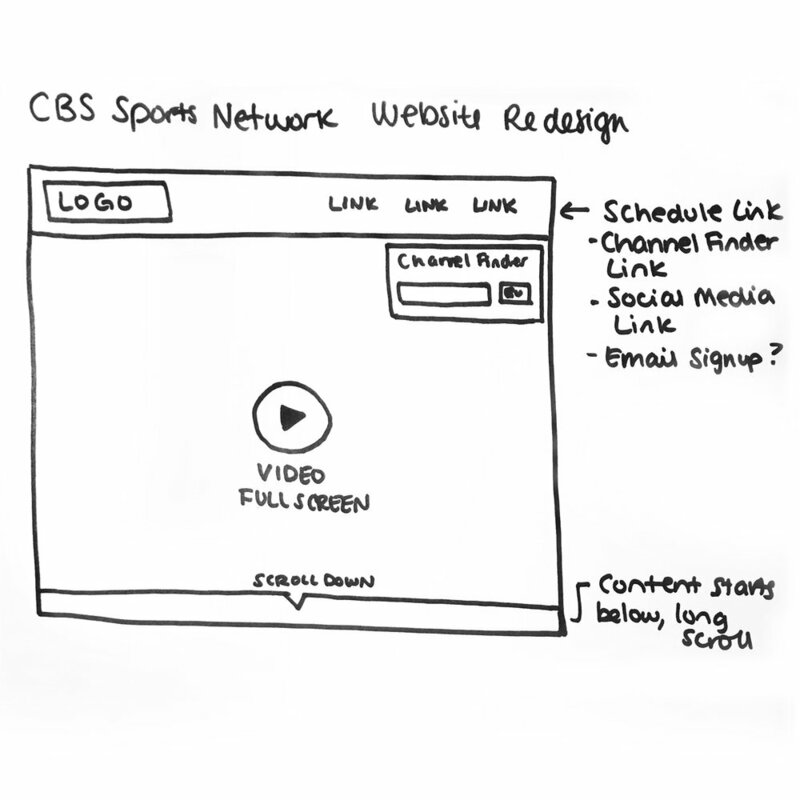 To maintain brand consistency, our goal was to make CBS Sports Network look stylistically in line with CBSSports.com. After discussing sketches, we created low-fidelity wireframes for each module, which we then discussed with the developer, until we finally narrowed it down to the most viable option both for our budget, server capabilities and overall project goal. Most important and central to our project goal, we focused on incorporating the Channel Finder into the site, making it immediately and easily accessible to visitors without requiring them to leave the page. We wanted users would be able to browse the website and check for their local channel at any time, in theory lowering the bounce-rate and retaining visitors to browse website content. 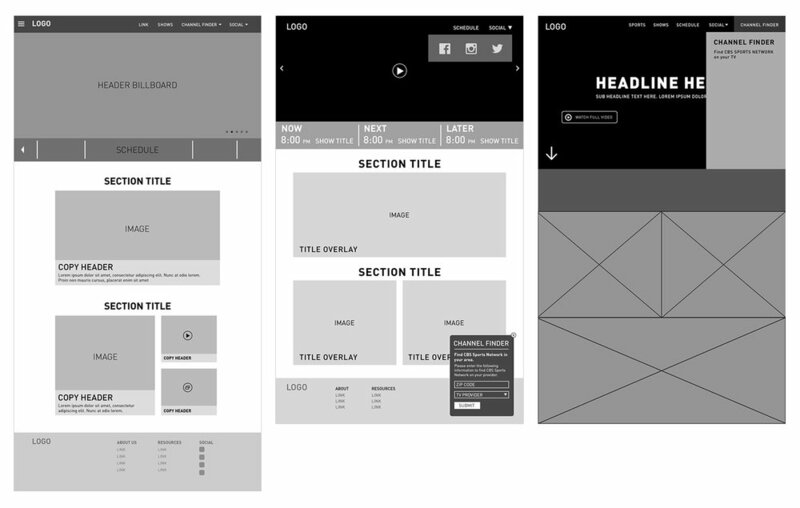 Throughout the wireframes, we tried to incorporate several of the elements we found from the research. For instance, a Channel Finder could be fixed to the top nav and slide out like a form from the right hand side, as in (3). It could also be a hovering button that is fixed to the bottom of the page, as in (2). Both of these solutions do not require the user to leave the page, and are fixed elements throughout the website. For the schedule, I tried out a couple solutions where an abbreviated version would appear on the homepage. I thought about creating an hourly on air in (1), or a "Now, Next, Later" version as in (2) that wouldn't be a little more loose and only focus on network highlights. Overall, we wanted the design of the website to be modular and customizable, yet not overwhelming in the way CBSSports.com can be, or USA Today from which we took design inspiration. We wanted each modular block to be visually engaging, focusing on the imagery and key information rather than heavy copy - a design aspect the AMC website does very well. We delivered the wireframes to the developer and as the each module was being developed, we worked on high-fidelity wireframes and determining the overall style of the website. I was responsible for designing the schedule and editorial modules for mobile, featured below. Designing for the Channel Finder was a big part of this project, and what I was involved the most with. Not only did we need a fixed way to access the channel finder on any page, we also needed a dedicated page that could combine live video authentication as well as finding the channel on your local subscription. We approached the design for the channel finder/authentication page starting with the sketches to the right. Below is the current version of the website, with these changes implemented. Following the launch of the website, we continue to tweak and update it everyday in an ongoing effort to streamline the user experience.